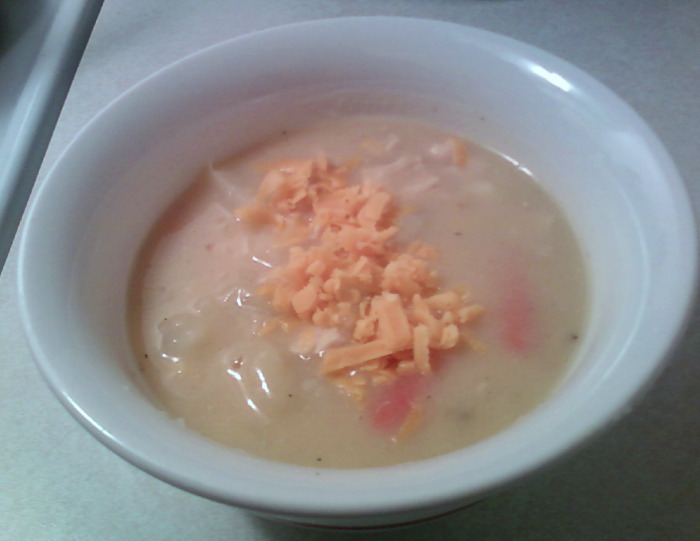 Flour Mayhem: Chicken and Potato Chowder! Man, do I love a good deal.. And to me a 10 pound bag of potatoes for a 1.50 was amazing. I only needed 3 potatoes to make the veggie pie, so I don't really know why I got the big bag. Oh wait, BECAUSE IT WAS CHEAPER THAN THE 7 BUCKS FOR JUST 3 POTATOES.. Duh! Just gave me a reason to make another dish with potatoes. 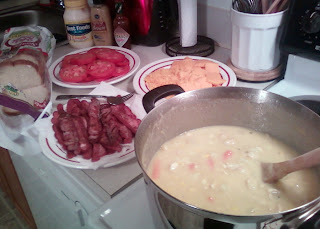 I have never made a chowder, but I do like them, and I figured now is the time to learn. 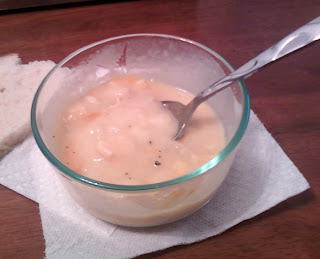 We moved to the North West, chowders are the cool thing these days. Tasty, Warm, Super tasty, and did I mention tasty? I really can not stress how awesome I felt last night when the chowder came together, I'm not gonna lie I was super scared it would turn out like dookie. When all was said and done and I tried it, I seriously said to myself 'Self, I'm proud of you'.. And then laughed at myself for talking to myself. Geesh, I'm no crazy person. It was really great when Jason got home and had some as well. He really enjoyed it, as well as the other dinner guests. So mission chowder accomplished! I also did some bacon and tomato sandwiches to go with dinner. The guys loved that, of course. Dudes always love bacon. It was a really great dinner, and I'm glad everyone enjoyed their meals! In a large pot, cook the bacon until crispy, remove and lay on paper towel to drain. Melt 1 tb of butter with the bacon drippings, then add chicken, garlic, and seasoning of choice to pot and cook until chicken is golden in color, and juices run clear. Add chicken broth and potatoes, bring to a boil, add frozen veggies, reduce heat to medium low, cover, and cook for about 20 minutes or until potatoes are tender. In a large bowl, pour in the 2 C of milk, and whisk in the flour. Pour into chicken/potato mixture and stir until mixture thickens. Once thickened, stir in shredded cheese. Top with crumbled bacon, freshly ground pepper, pinch of salt, and more cheese, if desired. The boys had theirs with bacon and tomato sandwiches, I enjoyed mine with just a slice of bread. Really great on a chilly evening.